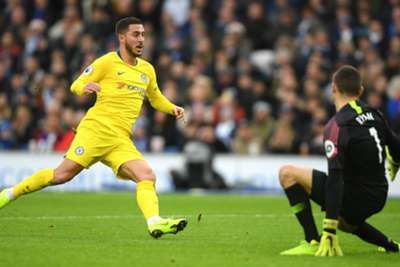 Eden Hazard's superb Premier League season continued on Sunday as he made a huge impact in the first half of Chelsea's clash with Brighton and Hove Albion. Hazard struggled to produce his best last term as Chelsea stagnated under Antonio Conte, who was replaced by compatriot Maurizio Sarri before the new campaign. Sarri has reinvigorated the Chelsea squad, with Hazard back to the form that has made him one of the most feared players in the league, and the Belgium playmaker laid on the first goal for Pedro before finding the net himself as Chelsea took a 2-0 lead at Brighton. His assist and goal mean Hazard has been directly involved in 17 goals in 16 appearances this season, more than he was in the entirety of the previous campaign, when he played a part in just 16 goals.